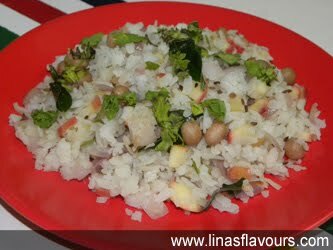 Take poha in a big flat sieve. Pour water so that it is only wet. Keep it aside. Take oil in a pan and heat it. Add cumin seeds, asafetida, curry leaves, onions and saute it for for 5 minutes. Add green chillies, salt, boiled peanuts and cook it for about 4-5 minutes. Add apples, poha, lemon juice and mix it well with a spatula so that it does not break. Cook it for about 3-4 minutes.